Average wall thickness, smooth inner and outer wall, good impermeability, high compressive strength, low cost, firm and reliable tie-in, convenient construction, high efficiency, and instant film-releasing maintenance, etc. Since all the tubular products are used widely in irrigation in the field, water supply and sewage works in the town. Workers prepare the steel cage. 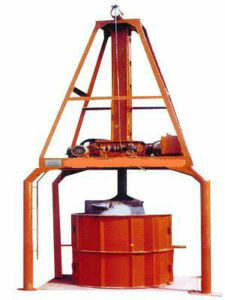 This cage can be made by manual, also can be made by automatic machinery. This machine could weld cage by automatic way. One worker clear the mould, while brush de-mould oil. Use 5-10Ton crane to lift steel cage into mould, then use screw nut to fix the mould. Lift the mould in to overhang rolling machine, while lock the machine and start running. JS500 or JS750 concrete mixer mix the cement, sand, stone material, then feed to the mould by automatic material feeding belt conveyer system. Mould will be under the high speed running, the material will be press into mould through main machine main shaft. After some minutes ,when material fill the mould ,then stop and open the machine, use 5-10Ton crane to lift the mould with pipe to empty yard place. After 3 hours, open the mould, then wait 5-7 days water curing. If you have interests in these products, please leave your message, our relevant staff will contact you quickly.